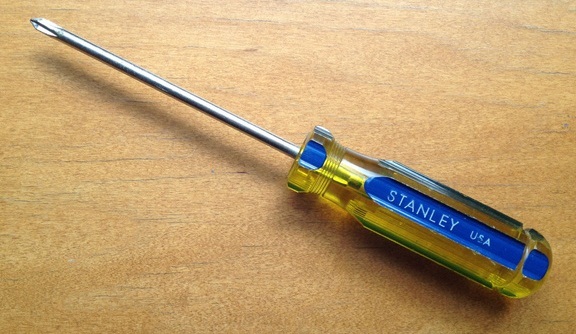 Gizmodo is known for covering high-tech gadgets, but recently Harry Sawyers wrote about something decidedly low-tech: the basic screwdriver. He points out that there are plenty of design improvements that could be made to the standard model (shown in his photo above) - add a non-slip grip for sweaty palms, ratcheting action for quicker turning, or changeable drive bits for versatility. True, these are all great usability gains, but they aren't without a price. Let's score it, with totally-made-up numbers: if you gain 5 points of usability for a grip, 10 points for ratcheting action, and 5 for changeable bits, maybe you lose points on durability: 0.1 for the grip that will slowly degrade over time, 0.3 for the ratchet which may break, and 0.6 for bits that can be lost. So is it worth losing 1 point of durability to gain 20 points of usability? That depends on what you want from your tools; some people prioritize convenient features, but others want tools that will last a lifetime or more. It's a classic tradeoff - and that's why both are out there for sale, and that won't change anytime soon.